National Walk in the Park Day Project Spotlight: Art and Myra Bright Park — Binkley & Barfield, Inc. The park at 2500 Raintree Drive had been known as Raintree Park since the 1980s. Art and Myra Bright built the first home in the Raintree subdivision in 1978 and were active in community service projects. 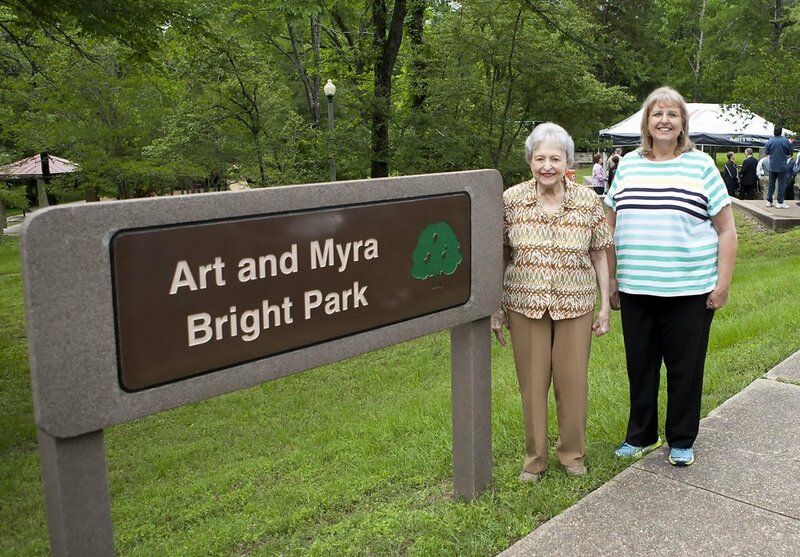 To honor both Myra and Art, the Raintree Homeowners Association renamed the Raintree Park to the Art and Myra Bright Park in 2015 to recognize their generous donation of time and resources to several community organizations. Art, who passed away in 2015, was a math teacher and multi-sport coach at A&M Consolidated High School before becoming principal. Myra, who passed away in February of this year, worked at the Texas A&M Transportation Institute for 20 years. BBI provided engineering design and construction management services on this park project. The goals were to provide ADA access to all major facilities throughout the park and to avoid/address drainage concerns in the area of the sidewalks. The project had very tight parameters to meet ADA standards due to the large amount of elevation changes throughout the park. BBI performed extensive three-dimensional modeling to provide positive drainage and meet ADA guidelines. The FEMA floodplain ran through the lower park area, which raised concern for drainage impacts. By utilizing the 3D model, BBI was able to provide a solution that did not impact the drainage way but addressed erosion and ponding concerns along the walkways. The lower sidewalk alignments were modified to avoid a large creek bank and undermined sidewalks. Two sections of sidewalk experienced flood water erosion issues that caused a steep drop off adjacent to the sidewalk edge. Prior project experience showed TrueGrid permeable paving to be a viable solution. After research and contact with representatives, BBI determined that it was a cost-effective solution to address the erosion issue. BBI worked closely with City of College Station staff to make sure the limits of the project effectively utilized available funding. All major facilities now have ADA access throughout the park and drainage concerns have been mitigated. So how can you celebrate National Walk in the Park Day? That’s easy! Wear your finest walking shoes, leave your phone behind, and breathe in the fresh air as you walk around your local park. Each one has a history!